Check out this deal from Canvas People where you can get 65% off canvas prints, plus you’ll get FREE shipping! 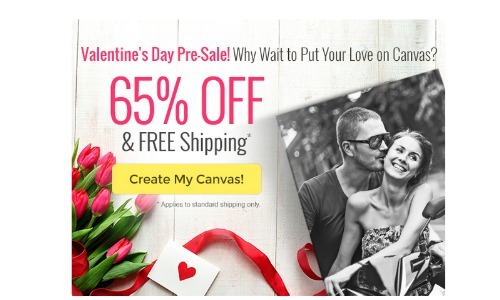 This deal from Canvas People doesn’t require a coupon code and you get some great canvas prints just in time for Valentine’s Day! They have several great canvas print sizes and you can get a great deal like an 8×10 for $17.50 (reg. $49.99) or a 16×20 for just $32.89 (reg. $93.99). If you order it by 2/3, you can get your order in by Valentines Day with FREE standard shipping. Otherwise, you will have to pay for Express and Priority Shipping to get in by Valentine’s Day.